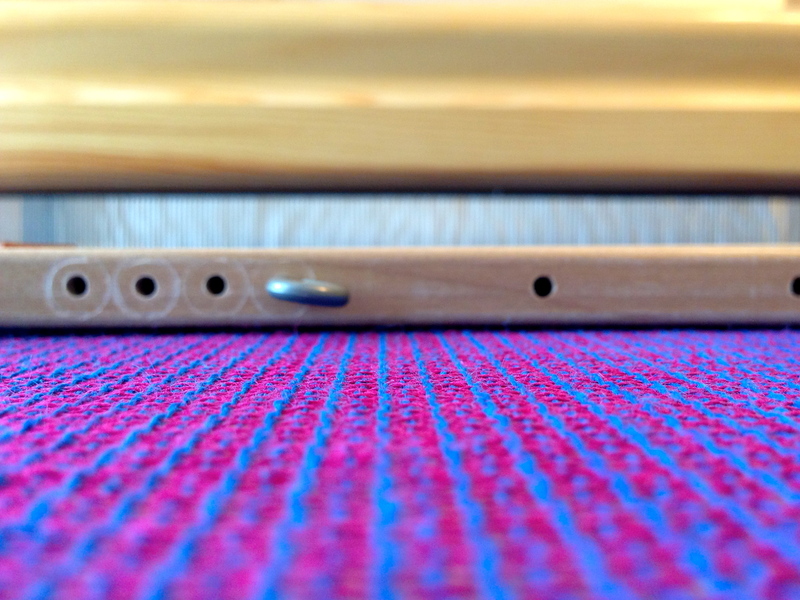 Whenever I cut new cloth off the loom I am reminded of how much I have. 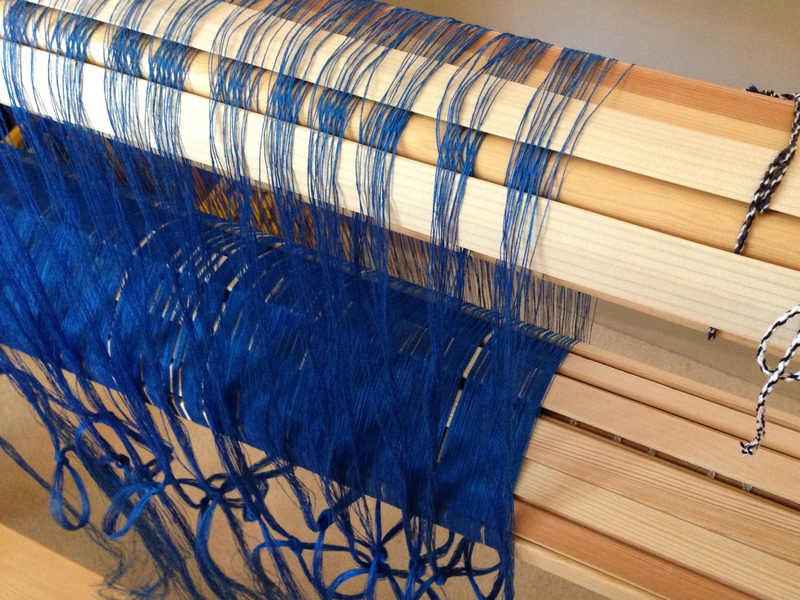 I feel extremely fortunate to get to do what I enjoy–weave! At the same time, I know there are many people in great need. Is it possible to establish a rhythm of giving? I want to be aware of the needs around me, caring enough to make a difference. 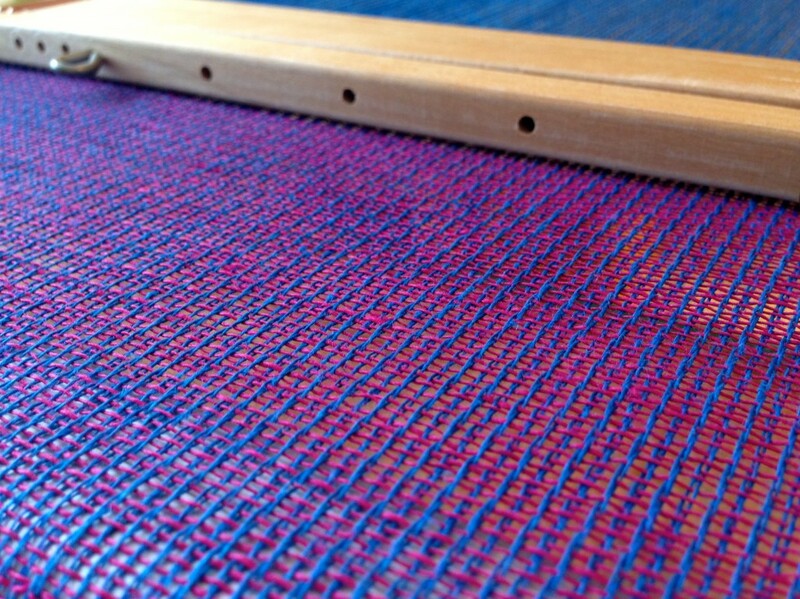 Linen fabric, just off the loom. 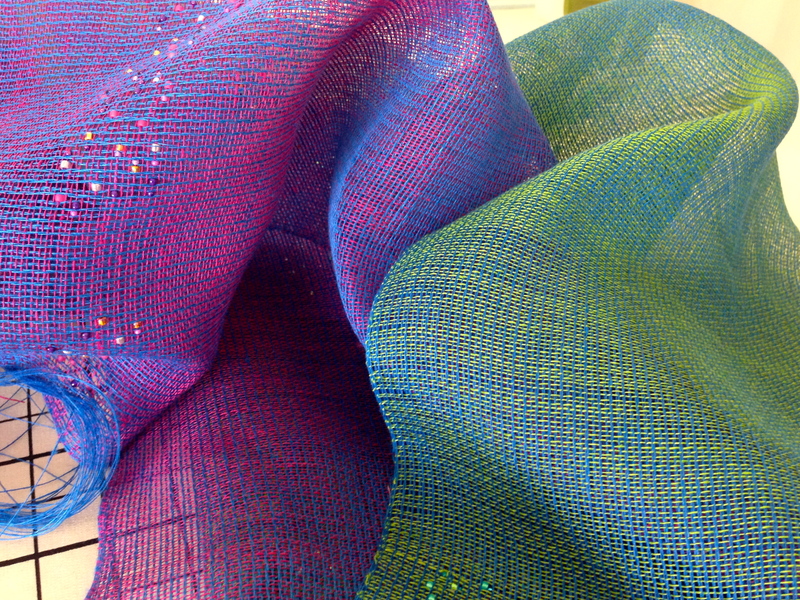 I was hoping this fabric would be iridescent; and it is! What if…, every time I come to the end of a warp, I intentionally help someone in a tangible way? Since I weave one warp after another, this could be a routine reminder to put kindness into action. What ideas do you have for establishing a rhythm of providing for others in need? May you continually experience the joy of giving. What a wonderful gift playing the cello for someone. It’s a gift from your heart! Thanks, Claudia. I feel like I gained as much as Sam did. It was such a wonderful connection with a very special person. Yes, Betty, planning is a great way to make good intentions a reality. I love the thought of making things that represent me in some way, so thank you for the wonderful compliment! I love making bands! 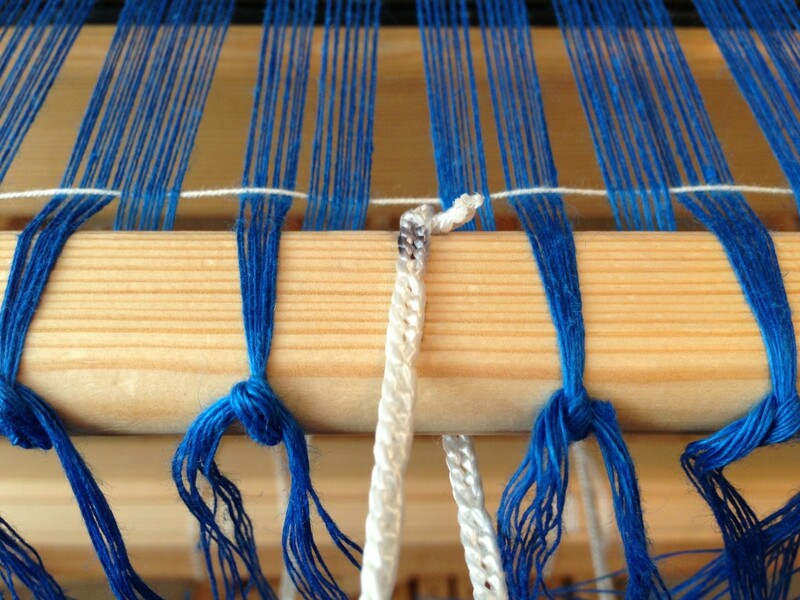 I started weaving bands in the 1980’s on my inkle loom; and more recently, I have been weaving bands on my Glimåkra two-treadle band loom, like these bands. 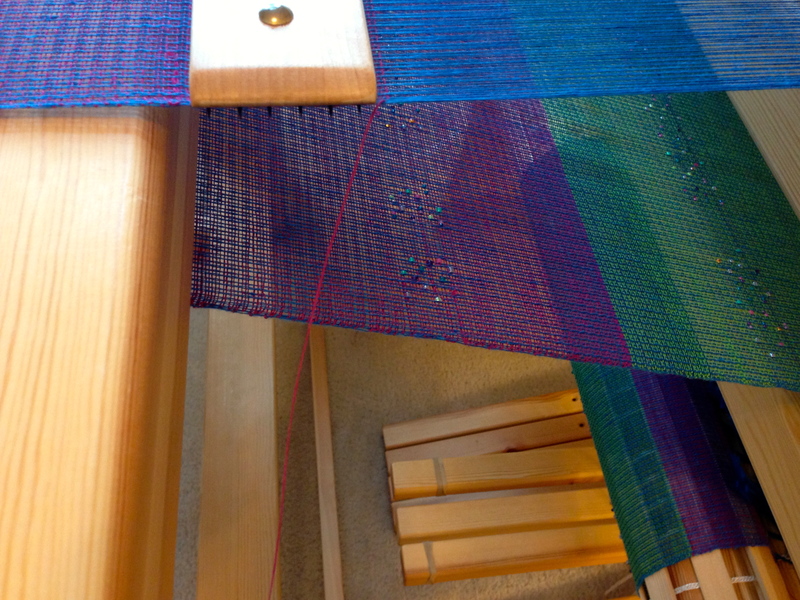 Now, I am also learning to weave bands with a small rigid heddle. (The pattern for this Sámi band is from this book – not an affiliate link.) 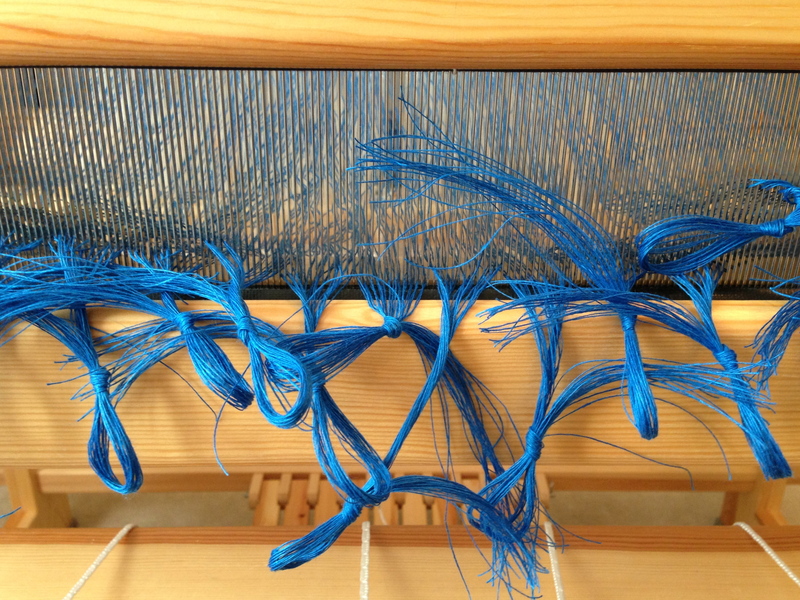 There are rudiments of weaving that form a basis for understanding and developing skills. In the arena of faith, convictions are the rudiments that form a basis for learning and growing. Doubled 8/2 purple cotton thread forms the pattern, and single strands of 8/2 unbleached cotton are used for the background. 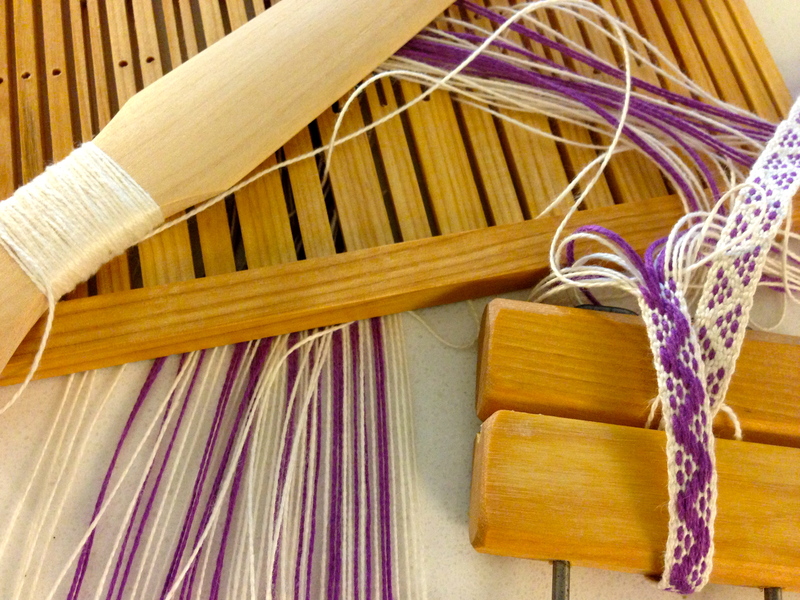 Tools used are a rigid heddle, a shaped band knife, and a band lock. Understanding these and other basics will give you a good foundation for any type of weaving, large or small. If I keep these essentials in mind as I practice, I have every hope that I will end up with something worthwhile. Convictions of the heart form the basis for learning how to live in a meaningful way. When these convictions arise out of faith in our master weaver, they are accompanied with unfailing, unwavering, and unending hope. And hope assures that the journey is worthwhile. May hope be your lifelong companion. There are some things more important than weaving and blogging. Family, for instance. We had a special family member capture all our attention this week. The last picture shows what I’m talking about. If the captions seem brief this time… that’s why. Enjoy! Heddles are threaded with 16/1 linen ends. Ends are sleyed through the reed. Warp is tied on to front tie-on bar, with leveling cord in place. 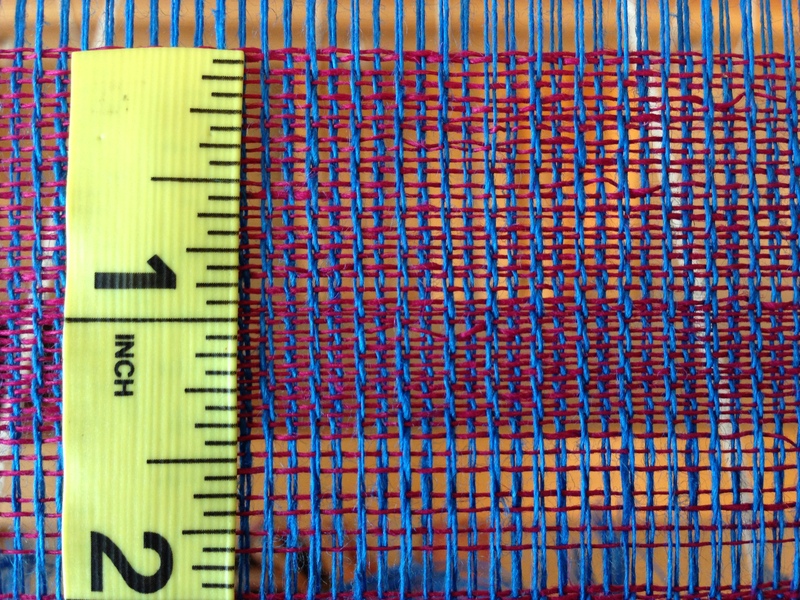 Measuring picks per inch to get the correct weft density. 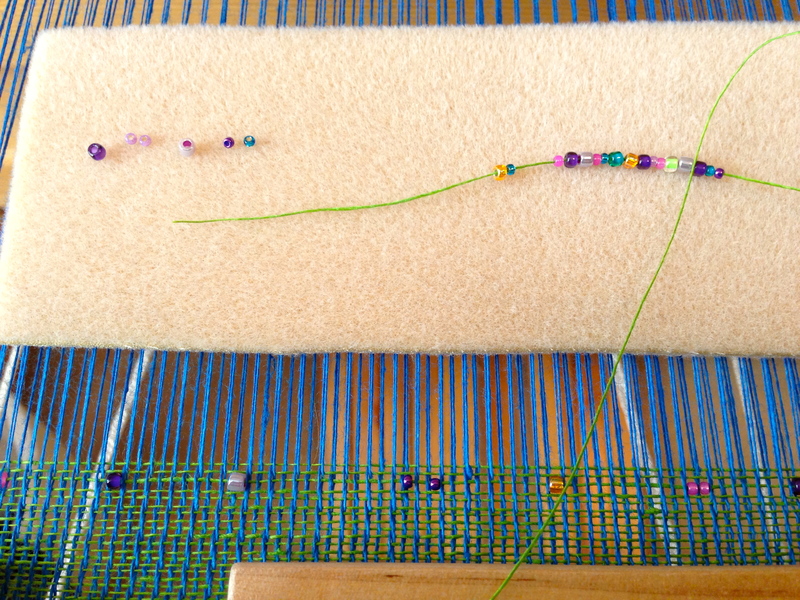 Adding beads to the weaving. Green weft, followed by magenta weft. 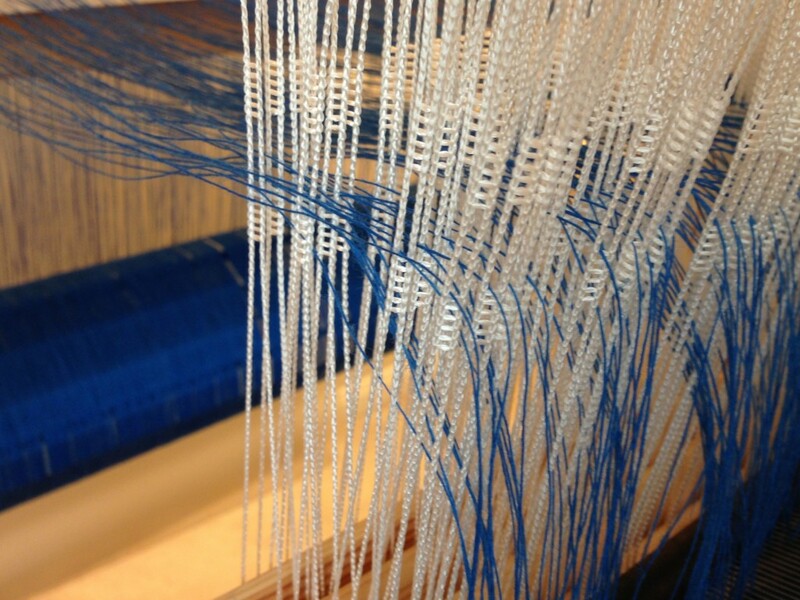 Linen fabric on the loom. Elias Luke made his entrance this week. He is our second grandchild, and our first grandson. We are delighted! May your family bring you delight this week. 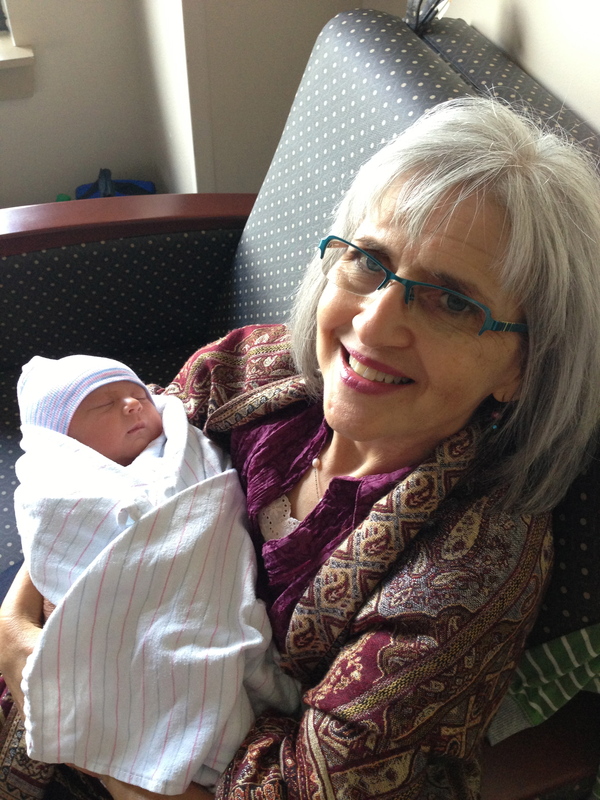 Beautiful picture of a precious newborn and loving grandmother! Welcome to Elias Luke! May God richly bless the whole family through this precious gift of God. Elias is indeed a precious gift! Thank you, Bev! I guess weaving baby blankets comes next? What a precious bundle of joy. Barbara, remember, we’re in Texas, so he won’t need a lot of blankets. haha… But I’ll make sure he has something special from his Lola. The look on your face warmed my soul. And little Elias is precious. Congratulations. Laurie, thank you so much for your sweet sentiments! It is obvious where I changed the weft color, leaving a distinct line from one color to the next. I am intrigued, though, by the subtle color differences that appear within a single weft color section. It is amazing to see how different the color looks just by changing my angle of view. Blue, with a touch of pink? Or, deep red-purple? You would think I am describing two different cloths. When we view each other’s ideas with understanding, it helps us show mutual respect, even when we see things differently. Linen fabric for bags, with narrow strip of beads. Green weft and magenta weft produce two different colors of bags. Sadly, it is easy to put down or belittle others. I, like many, have strong viewpoints about right and wrong; but if I use words as weapons, I destroy the very fabric I want to protect. An understanding mindset gives you the willingness to listen to another viewpoint, and it helps you hold your tongue. It doesn’t mean we always have to agree. As hard as I try, I may never be able to see the colors you describe in your cloth. I may even try to convince you to see it my way. But hopefully, we will both seek to understand each other. May you have an opportunity to practice understanding. I dabble in tapestry weaving–still in the insecure beginner stage. Tapestry weavers use a visual guide for weaving, called a cartoon, which is simply a drawing of the picture being woven. Placed directly under the weaving area, the cartoon shows the distinct lines to follow. It keeps everything in context with the overall design. Some people go through life without a meaningful guide, just hoping things turn out okay in the end. 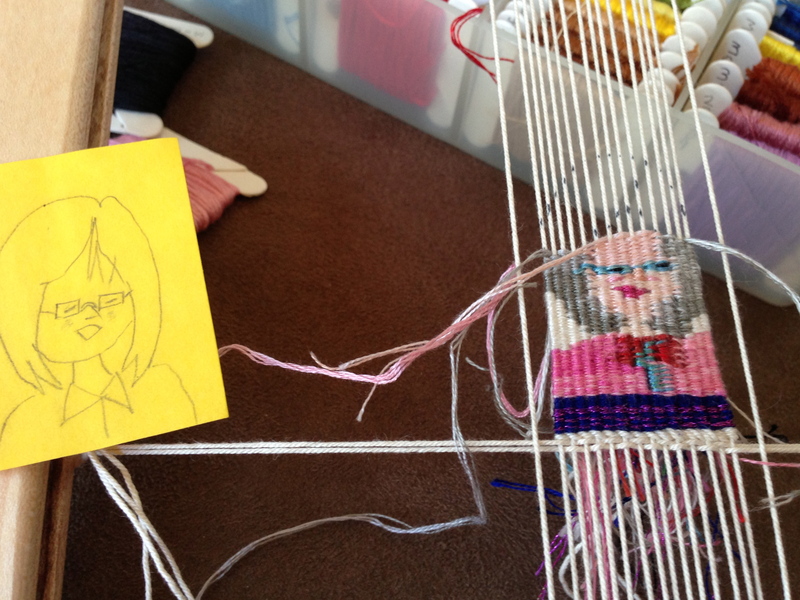 Miniature self-portrait tapestry, one inch wide, has a simple cartoon sketched on a sticky note. Abundance of embroidery floss (left over from cross-stitch days in the 1980’s) provides plenty of colors for shading. Granted, my finished piece does not always end up looking like the cartoon. I am not trying to produce a masterpiece; but paying attention to what works and what doesn’t brings gradual improvement. Life is an adventure, holding an unknown future. If you plunge forward, making up your own rules as you go, you risk ending up in an aimless mess. What if our master weaver has a cartoon designed for us, a map for our lives? I would rather choose that guided path rather than one with no direction. And when I miss the mark, he finds a way to fix it or weave around it. In the end, it becomes his masterpiece. May the lines guiding your life tapestry be clearly drawn for you. Thanks be to God for His love for us, that He is our Guide and He knows the future. Your blog this morning reminds me of Jeremiah 29:11..His plans for us are always the very best. Thanks so much for writing, Karen! Save for church or evangelizing. Hi Charlene, Thanks for letting me know what you think. I’m sorry for disappointing you. 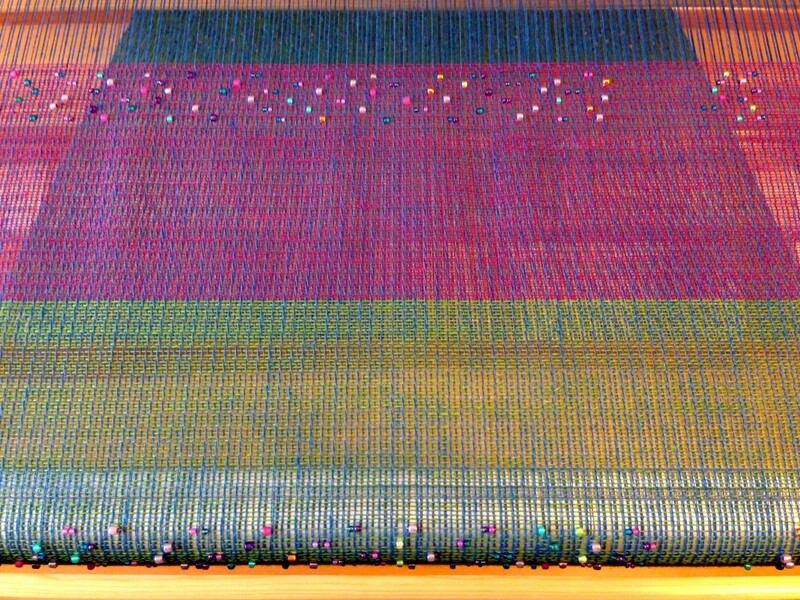 I could leave my weaving in my weaving studio, but it’s such a delight that I want to share it with others. My faith is that way, too. A technical question – What happens to the ends of the various threads you are using? Do they hang loose on the back and get trimmed? On another note, Barbara, this tapestry frame is a new smaller one that Steve made for me last weekend (it’s the same size as an iPad). I’m hoping to use it on my long flight overseas next month. No tatting this time, like you and I did together on our trip 2 years ago. He’s such a handy man. True. I think I’ll keep him.